I grew up sailing lasers and love having at least four sets (of mainsail telltales). Most sailors think this is overkill, but I think more information on the wind flowing thru the sail only can help. Think of your mainsail as a multi-dimensional continuously variable transmission. Its shape and angle of attack determine how efficiently you use the wind’s energy. How do you monitor the performance of this big piece of cloth? On a cat-rigged boat, telltales near the luff can help, if you know where to put them and how to use them. In this article, we’ve compiled the wisdom on luff telltale placement and material. This will set the stage for future articles on sail trim and steering. Not everyone uses mainsail telltales. For example, we looked at pictures of Bill Draheim, current MC national champion. Bill does not use mainsail luff telltales. Bill writes, “I don’t put telltales on MC sails, but some of my customers put a telltale up about mid way and back a couple feet. Typically when a telltale in that position is flying properly, a set lower than that usually stalls and a set higher than that looks under trimmed. I only use telltales on the shroud to get the most accurate look at the apparent wind angle.” See Bill’s video in our post on shroud telltales for more on his approach. On a cat-rigged boat, luff telltales are sometimes called steering telltales, much like the telltales on a jib. They help you find the precise upwind angle for different gears, such as footing, pinching, or max Velocity Made Good (VMG). For some basics on steering with telltales, see Focus on Angle – The Key to Upwind Performance, by the International Sailing Academy. Luff telltales, along with leech tales, also help with sail trim, including depth and twist. We’ll discuss much more about sail trim and telltales in future articles. The ideal distance behind the luff balances the needs for sensitivity and stability. When sailing upwind, luffing and stalling begin at the the luff of the sail, so you want the telltales as far forward as possible for precise steering information. Telltales further back are less sensitive to steering errors. For example, perhaps you’re having trouble with pointing. One of the many causes of poor pointing is steering too low and stalling the leeward telltales. If your luff telltales are too far back, you may be stalling the sail without knowing it. You can check this with a telltale placed further forward than normal. due to the separation bubble around the mast. The size of the separation bubble depends on mast shape, sailing angle, and wind speed. For more about the separation bubble, see Higher Performance Sailing, section 13.16. Also, in waves, with the boat bouncing around, you may want a less sensitive set of steering tales further back. Many sailmakers put two sets of steering telltales down low near the luff: one further forward for flat water and medium breeze, and another slightly further back and perhaps higher for waves. Thanks to Arvel Gentry, you can determine the best distance from the luff for the telltales on your sail. Gentry was the Boeing engineer who first taught sailors about aerodynamics. One of his contributions was the Gentry tufts system of telltale placement. The system is described in detail in Gentry’s July 1973 article in SAIL magazine. If you want to improve your windward sailing performance, also read his November 1973 article. Place a horizontal row of steering telltales, beginning about 6″ behind the luff. Use nylon ribbons with tape. Space them a few inches apart, so that the row of telltales extends back to 20-30″ behind the luff. Go out and sail in strong wind and note which telltales are always stalled due to the separation bubble behind the mast. The separation bubble ends closest to the mast in heavy air, so this is the limiting case. Remove the telltales that are always in the separation bubble. You will find that the remaining forward-most telltales are further forward than the sailmaker placement. This will give you the advantage of more precise steering information. You want be able to check the telltales quickly, so you don’t want them too far up. However, the bottom 10-20% of the main generates less power and has more turbulence due to edge effects. Some sailmakers place the lowest set of steering telltales about 10% of the distance up the luff, while others start at 20-25%. In light air, I get great feedback about steering from telltales that are only 10% up the luff. I can see these easily, even when sitting under the boom. In medium air, I use the 20% height, since the lower telltales seem to stall more. Ideally, you want to monitor the shape of the sail from the foot to the head. To do so, you can use more than one set of luff telltales, along with your leech telltales. Sailmakers use as few as two sets and as many as four sets spaced vertically up the sail. All of them align the luff telltales horizontally with any leech telltales to allow comparison of the air flow across the sail from luff to leech. Do all the sailmakers agree on where to place telltales? Using pictures from MC Scow regattas, we developed the diagram on the right and learned that there are some differences. From this diagram, we identified three options, ranging from KISS to the “more information” approach. We’ll describe these in terms of sets of telltales. A set consists of two telltales – one on each side of the sail. The port and starboard telltales in a set are slightly offset from each other for visibility. North Sails uses the “keep it simple, …” approach, with two sets down low for steering and two sets up high for upper sail shape. The lowest set of telltales is about 10% up the luff and about 20″ back. This is lower than most other sailmakers. The second low set is higher and further back for more stability. The two upper sets are in line horizontally with each other and with the second batten from the top. North also uses one leech telltale on the top batten. Leech telltales are critical for light and medium air sail trim. UK adds a mid-mast set to the KISS approach. 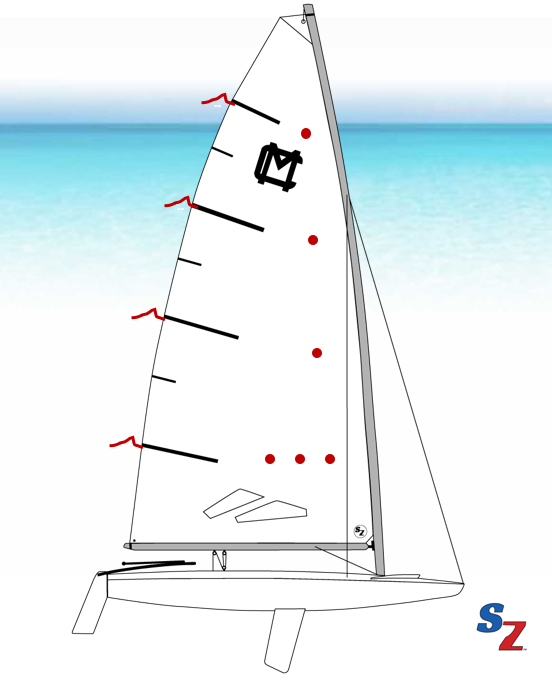 This allows you to monitor the powerful middle elevation of the sail. UK also provides three sets of steering tales down low, and a second leech telltale on the small batten below the top main batten. UK’s luff telltales are are 20″ back from the luff. As Rob Seidelmann says, it’s nice to have more information. Rob sails a Moorhouse/Sobstad MC sail and he uses telltales at four heights, aligned with the four main battens. The main battens each have leech telltales. Rob also uses three sets of steering telltales for the lowest set, aligned horizontally. He claims that the set is 20″ back from the luff, but isn’t specific about this measurement. The pictures I saw show at least one of them further forward than the other sailmakers. As a laser sailor, he may be taking advantage of the insights in the Gentry tufts system. Yarn recovers more quickly after being wet. Watch SailZing for a product announcement coming soon!